DODDRIDGE COUNTY, W.Va. -- Oil and gas workers didn't seem to appreciate the "Go home frackers" sign in Lyndia Ervolina's front yard here in northern West Virginia, where Marcellus Shale wells dot the landscape. "It was so amusing. I'd watch them out the kitchen window," Ervolina said during a recent interview at her home. "These guys would walk over and look at that sign, and then one of them would kick it. They'd knock it down on the ground and stomp on it and walk away. "And I'd walk back out there and set it up again." Other showdowns between industry and frustrated landowners have been more hostile, often leading to confrontations and even courtroom battles. The primary complaints: traffic, noise and odors from the area's new natural gas wells, compressor stations and pipelines. Doddridge County and other parts of northern West Virginia have faced a Marcellus drilling frenzy in recent years. Photo by Ellen M. Gilmer. It's a familiar story in shale country, where nuisance complaints from landowners have grown routine. As hydraulic fracturing and horizontal drilling open new swaths of the country to development, drillers eager to cash in on the boom are moving closer and closer to populated areas. And in the eastern United States, where homes are not as spread out as in traditional oil and gas territory like Texas, the increased friction between drillers and their neighbors can be particularly acute. "We've been inundated by so much so fast," said Doddridge County homeowner Lora Price, who lives near a natural gas processing plant and a compressor station. "Almost every road, every hollow has something going on. It doesn't seem to matter where you go; you're going to see a pipeline or a compressor station or a well pad." In 2013 and 2014, more than 200 north-central West Virginia residents decided they'd had enough. Scores of lawsuits were filed against Antero Resources Corp. and Hall Drilling LLC, saying the inconveniences that come with nearby oil and gas production have made it impossible for the residents to even enjoy their homes. "The number is rather remarkable," said West Virginia University College of Law's Josh Fershée, referring to the sheer volume of lawsuits. Ervolina and Price, who are both plaintiffs, said they could not discuss details of the ongoing litigation but could describe the everyday impacts of shale development on their lives. "Basically, we're going through a process where people are starting to evacuate this area," said Ervolina, a West Virginia native who has lived with husband Anthony in their house for 35 years. "A lot of people are just starting to leave because it's just a mess." The lawsuits against Colorado-based Antero and Hall, a local company, have now been rolled into one mega-case before the state's Mass Litigation Panel, a group of seven circuit court judges who streamline proceedings for related complaints. Antero and Hall fought hard against the consolidation, fearing a one-size-fits-all decision affecting disparate cases, each with unique circumstances. But the panel pushed on, aiming to establish a "uniform body of law." That way, landowners and industry can have a clear understanding of their rights once the case is resolved, instead of having multiple threads of litigation drag out on appeal for years. The approach raises the stakes for industry. While any single nuisance lawsuit would be shrugged off as relatively minor for an oil and gas company, a decision for the plaintiffs in mass litigation could result in a tougher penalty for Antero and Hall across the board. Antero is also facing a compliance order from U.S. EPA for improperly discharging fill material into wetlands and streams in West Virginia and was cited by state regulators for drilling a horizontal well that hit an existing vertical well and caused a methane leak. In all, the company had at least 27 reported spills in the state in 2014. While Antero declined to comment for this story, the company has acknowledged in financial filings that it is facing lawsuits in West Virginia, Ohio, Pennsylvania and Colorado from plaintiffs who have alleged various damages from oil and gas activities. "The plaintiffs have requested unspecified damages and other injunctive or equitable relief," Antero's most recent quarterly report says. "The Company denies any such allegations and intends to vigorously defend itself against these actions." Beyond the direct impacts on drillers involved in the big case, a win for plaintiffs would resonate throughout West Virginia -- sending a message to other producers to minimize impacts on neighbors or else face the kind of uprising staged by the mass litigation plaintiffs. But for now, the litigation's path forward is unclear. Neither side indicated any plans for settlement after a mediation hearing late last month, and those involved in the case are keeping quiet about the proceedings. Outside experts, meanwhile, are watching the case closely. They say any new precedent for nuisance law in West Virginia would also raise eyebrows in other parts of the country, where various jurisdictions are attempting to define exactly how much inconvenience from drilling is too much. The traditional legal test for a nuisance claim stems from common law: Does an action unreasonably interfere with the enjoyment and use of one's property? The interpretation of "unreasonably" can vary dramatically depending on the jurisdiction and circumstances, with some judges and juries excusing alleged nuisance activity when the defendant has at least made an effort to be unintrusive. 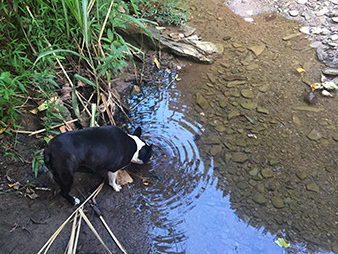 Anthony and Lyndia Ervolina's dog, Roxy, drinks from a stream on their property. The couple worries about the impact of oil and gas spills on the water. Photo by Ellen M. Gilmer. In the oil and gas context, plaintiffs generally have a tough time demonstrating that any nuisance they have experienced warrants enough in monetary damages to cover the cost of going to court in the first place. In one Texas lawsuit against Chesapeake Energy Corp., for example, a jury agreed that the company's actions were a nuisance but awarded the homeowners $20,000 -- pocket change compared to the legal expenses. In 2013, a major win for plaintiffs raised suspicion that the tide might be changing. In the landmark Parr v. Aruba case in Texas, a jury found that Bob and Lisa Parr, who say they suffered health problems from the air emissions of nearby well sites, were entitled to $3 million for the nuisance the wells created. The verdict was the biggest known award of damages to date for a nuisance case related to shale drilling and was predicted to embolden other landowners to file their own nuisance suits (EnergyWire, July 16, 2014). The West Virginia litigation could serve as a similar model. In the Mountain State, the legal test boils down to the same question of reasonableness, but as long as the drillers' actions are not considered reckless, state precedent also allows a balancing of interests between the plaintiffs and defendant. In other words, the court may consider whether industry's interest in producing natural gas outweighs residents' interest in peace and quiet. Price said she understands the conflicting interests, but wishes residents who support the industry would take a longer view. "They've got jobs, they've got income. I don't begrudge them their jobs," she said. "It's a shame that they can't see the broader future. It's mostly about 'What kind of money can we earn right now?'" Fershée, a law professor and associate dean for faculty research at WVU, said several factors make West Virginia ripe for the debate. 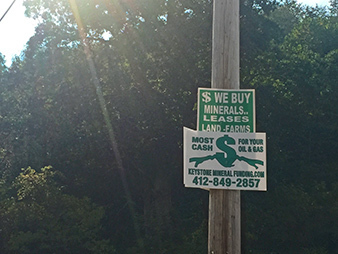 First, he said in an interview, West Virginians typically do not own their mineral estate. The prevalence of split estates means that residents without a lease or a royalty check are often bearing the inconveniences of the shale boom without directly joining in the rewards. West Virginia's mountainous topography also creates unique traffic problems, Fershée said. "There's a lot of places where there's one way in and one way out," he said. "In other states, there are often ways that you alleviate some of that tension by building another road, which isn't a big deal because you're not literally moving a mountain to make that happen." And the state's long history of coal mining -- which has not generally spread wealth to lower classes -- may have prompted residents to develop mistrust for extractive industries, Fershée said. "In West Virginia, coal is the backbone of industrialization but not of local profit," he said. "People may see gas as kind of the new version of that. There's a skepticism of industry." But Price's daughter, Autumn Long, who is fighting her own battle against a pipeline company that wants access to her property in nearby Harrison County, said West Virginians have not become outraged enough. "In this state, there's been such a long history of exploitation and repression, and the population of this state has been walked over by the fossil fuel industry for so long," she said. "I'm always amazed to see what people will put up with. People just sit in their cars and sit in their cars and let these trucks drive past." Still, she said, opposition seems to be slowly building. The added local impacts of major interstate pipeline proposals, including the Atlantic Coast and Mountain Valley lines, may push some otherwise complacent residents to the edge, she said. "Everyone has a breaking point eventually, and I think that people are being pushed to that point now," Long said. "Unfortunately a lot of times, you don't do anything about it until it's in your backyard. And that's what's happening now: It's in people's backyards." The tension between those supportive or tolerant of drilling and those actively fighting industry expansion is clear. Price said she's now known as the neighborhood "troublemaker," with at least eight neighbors employed by the oil and gas industry. Robert McClain, who has lived on a farm in the Doddridge County community of Big Isaac since the 1940s, said his brother hasn't spoken to him in years, due to disagreement over whether to lease mineral rights under the family property for shale drilling. Even families in agreement on the issue are split on how to respond to it. Anthony Ervolina, who grew up in Queens, N.Y., said he's fed up with the vibrations, the traffic and the gas fumes that fill his yard every evening, and he wants out. The family's carefully landscaped property, filled with bamboo stalks, lilac trees, vegetable gardens and an outdoor dining area, has fallen into disuse while the couple decides whether they should stay -- an emotional decision for Lyndia. "I absolutely love West Virginia with all my heart," she said while looking out at her yard last week. "I don't want to leave my home. If we all get up and leave, West Virginia is gone. But I need to leave." "I feel like I am standing on the train track watching a train bear down on me," she said. "Sometimes I think I must be crazy. Why am I doing this? But I have invested so much in my life and in my home, and everything I have is in this space." The only hope, they say, is more public outrage and organized opposition from neighbors affected by the everyday impacts of industry. The mass litigation is a start, Price said, but she's having a hard time feeling optimistic overall. "The majority of people who maybe are adversely affected, they're still not speaking out," she said. "It's just the way it is." The mass litigation case is set for trial next year.